This Sunday has been a rollercoaster. 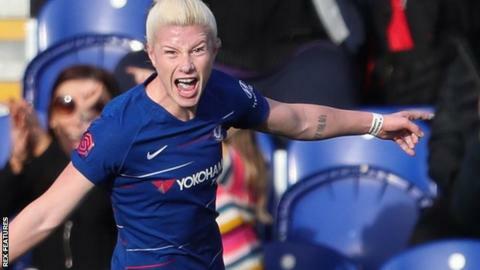 The Blues’ final home game of the Women’s Super League season finally ended 1-1, after an intense clash, where a second-half header from Gilly Flaherty canceled out Bethany England’s opening goal and gave the Hammers a goal for their effort. It was sincerely a disappointing result for Chelsea, but there was also good moments. This was a special occasion at Kingsmeadow as we celebrated Drew Spence’s 10 years in the Chelsea first team, and it seemed the celebration was going to be even better for her and all Chelsea supporters until Flaherty’s goal in the 65′. The match was an even clash between the two teams from start to finish, where Kingsmeadow reached a crowd of 2,854 to support both teams. Chelsea dominated the first half, with Bright being the bridge of the team in defense, and Ji and Drew controlled perfectly the midfield. That’s why it didn’t take long to see a goal. England was the scorer, taking her tally for the season to 18, as she stooped to head home a free-kick from Erin Cuthbert shortly before half-time. Chelsea was in a roll, but West Ham clearly didn’t give up on this one. During the second half, Chelsea had plenty of chances, but after struggling in the final 30′, West Ham scored through one of the few attacks they mustered. It came from the head of Flaherty, former Chelsea player, which made all Hammers’s fans stand out of their seats. In the end, it looked as though the game was going to end on a draw, but there was late drama when both Eriksson and Engman were denied by a magnificent double-save from West Ham goalkeeper Moorhouse to save a point for her side. It was a frustrating final home game of the WSL season for the Blues but didn’t prevent fans from celebrating Drew Spence’s anniversary with the team. Now, there’s an international break, which will be followed by two great semi-finals in April. First, they’ll face Manchester City in a fortnight’s time with a place in the FA Cup final and then it’s an epic clash with French giants Lyon to see which side will face Barcelona or Bayern Munich, with the Champions League trophy at stake.